More than two centuries after his death, Adam Smith’s life and work continue to have an effect on many individuals and organisations around the world. His published work, most notably The Wealth of Nations, has made a significant impact on the shape of modern economics and along with A Theory of Moral Sentiments, features prominently in any reference to the Scottish Enlightenment. As a result of this influence a growing number of landmark locations, institutions and programmes are dedicated in his honour throughout the UK. This is most prominent in Smith’s home town of Kirkcaldy, where the local college and theatre have been proud to take his name. The annual Adam Smith Lecture, hosted by the college, is a feature event which draws a prestigious audience to the area every year. Past guests and speakers include Gordon Brown, Kofi Annan, Emma Rothschild and Sir James D Wolfensohn. The University of Glasgow has also honoured Smith by dedicating the title of their highly respected business school to their former student and professor. 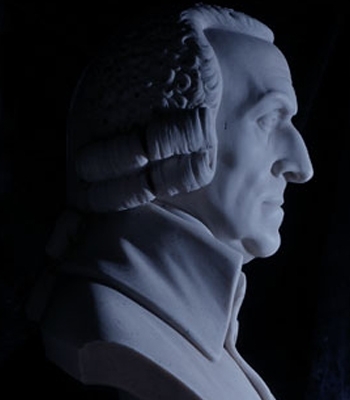 This is further enhanced by the Adam Smith Research Foundation, based within the school of social sciences, which aims to honour his enlightenment legacy through the provision of independent and original research. Panmure House, Edinburgh, was Smith’s final home, and is the only surviving house from his life. Since its acquisition by Edinburgh Business School in 2008 the building has continued to undergo extensive restoration work in an effort to create a long lasting monument to Adam Smith and his achievements. Once completed this restoration will provide a venue for the kind of philosophical and economic discussions that he was famed for hosting himself. The Adam Smith Institute remains one of the world’s leading policy institutions, providing practical education and policy engagement which is centred around Smith’s key ideas on free-markets and economic policy. In dedication to Smith, the Institute unveiled the world’s first major public monument in his honour in 2008, which stands in Edinburgh’s Royal Mile. Another one of Smith’s key achievements was to help found the Royal Society of Edinburgh along with other prominent figures such as James Hutton and Benjamin Franklin. The Society continues to provide public benefit through education and enlightenment.